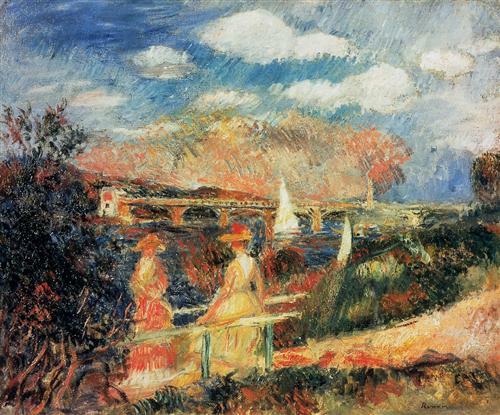 The Banks of the Seine at Argenteuil, Auguste Renoir. 1880. For some young friends of mine I have created a little printable to use in studying an Impressionist style painting. Impressionists paintings are a lot of fun to view with children because the subjects are often very simple and appealing. The Impressionist style uses colors that are vibrant and there are so many interesting things to discover in the artwork. Free Notebook Page to Download! Use this Impressionist Painting Scavenger Hunt printable to see what you can find during your next Impressionist picture study. We printed ours out, slipped it into a sheet protector and then used a dry erase marker to cross off the things we found in our painting. When you are finished, wipe off your sheet and save it in your art notebook for your next Impressionist study. You can use this printable along with the Impressionist paintings found on my Summer Art Pinterest board. If you missed my last post, I shared a free notebook page for Claude Monet. Follow the Pinterest board or this blog so you won’t miss any of the summer art ideas that I will be sharing as the season goes by. We have enjoyed the book Monet and the Impressionists for Kids: Their Lives and Ideas, 21 Activities (For Kids series) in our family over the years. It is much more than an activity book with loads of wonderful information to learn about each of the featured artists.